Mentioned today in USA Today's "Book Buzz." Mr. Toad (below) is pleased. ||| More on The Wind in the Willows: An Annotated Edition. "Pioneers may have been lured west by gold, but they stayed because of coal," says Sandra Dallas in her Denver Post review of Killing for Coal: America's Deadliest Labor War. A good point to be sure, developed with precision and grace by Andrews, whose geo-historical (is that a word yet?) approach has elicited much comment. Killing for Coal is part and parcel of a slew of Western history books we have done or are doing (see also Jared Farmer's On Zion's Mount: Mormons, Indians, and the American Landscape and Katherine Benton-Cohen's forthcoming Borderline Americans: Racial Division and Labor War in the Arizona Borderlands), in what's becoming an increasingly strong field for us. A westerner through and through, it seems, Andrews admits in this talk to the Colorado Yale Association that he never felt quite at home here on the east coast -- seems that the siren song of the Rockies was destined to call out for a native son's return. As Colbert says, "racism is over," right? But how free is "free"? Leon Litwack answers the question in the context of African Americans' struggle for civil rights; San Francisco magazine says his book is on target. A supremely thoughtful review of Slavitt's edition of The Consolation of Philosophy at Open Letters Monthly. On Boethius' heels comes Slavitt's soon-to-emerge translation of Orlando Furioso -- the man is prolific. Richard Nash of Soft Skull Press describes what it's like for an independent to publish during a recession. It's not a party, but nor is it the total doom-and-gloom scene you'd infer from reading about the tribulations of the major houses in the Arts pages of the Times. UPs like us in some ways constitute a unique category, neither here nor there, as our mission includes a whole set of scholarly commitments to uphold in addition to the traditional publisher's economic imperative. "...probably the commemorative par excellence"
... with regard to the upcoming Darwin mega-anniversary year -- that's the verdict on Evolution: The First Four Billion Years from this week's edition of Booklist. Strange that we haven't mentioned this book yet on the blog, because it is, in layman's terms, a B-F-D (we leave the parsing to you, reader). Simply put, this book tells you, in one volume, where we're at in terms of evolutionary thinking -- the "state of the art" in the most literal sense. We've assembled a great cast of contributors as well -- experts all, as you'll see from a glance at the table of contents. The Foreword, by Edward O. Wilson, explains why we decided to do this volume -- we've reprinted it below for you. "...beautifully written account of a personality about whom we cannot know enough." 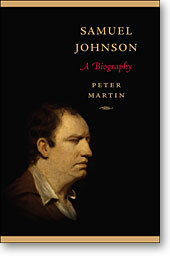 So says George Sim Johnston, writing in today's Wall Street Journal, of Peter Martin's Samuel Johnson: A Biography. ||| Read an excerpt from the book. No, not Richard Pryor "hysterical." Mark S. Micale's new book takes on the other kind of hysteria, the kind that's been attributed mainly to women ever since crusty old Hippocrates described the malady as the unfortunate result of a "wandering uterus" (thanks for the oath, Hippocrates, perhaps we'll pass on the "wandering uterus" theory). In Hysterical Men: The Hidden History of Male Nervous Illness, Micale locates the cracks in Western medicine's vision of the "stable and secure male"--a vision whose coherence rests, of course, on a converse notion of women as just the opposite, i.e. "hysterical"--and drives a big fat scholarly chisel into them. For hundreds of years, Micale shows, Western physicians have been covering up and explaining away signs of male weakness (how can men be hysterical, anyway, when THEY DON'T EVEN HAVE A UTERUS??) while simultaneously indulging in extravagant theorizing regarding the origins of perceived female weakness, over-emotionality, and madness. Some might even call their efforts, well, "hysterical." Hysterical Men has found some review space in what we like to consider our natural home within the media landspace--the New York Times Sunday Styles Section. Therein, Holly Brubach sees in Micale's work an attestation that "researchers discover and doctors diagnose only those conditions that their culture allows them to find." Yup! 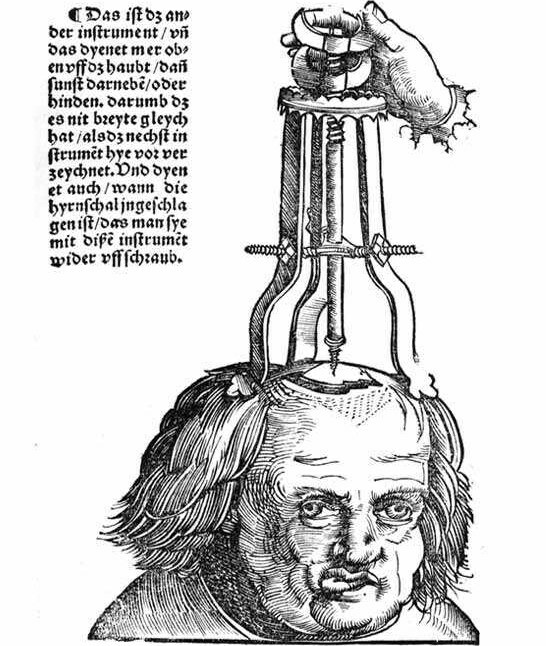 Image: Hans von Gersdorff, Fieldbook of medicine (1517). 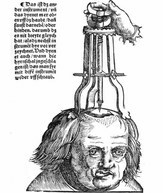 Treatment of a skull injury. Wood cut work attributed to Hans Wechtlin. Click to enlarge. Not exactly cheerleadery, then. And while it's easy to be distracted by Benjamin's dusty examples--Chaplin's films and Picasso's paintings--and therefore lulled into thinking he's describing a different world from Shirky's ... well, don't be. Substitute blogs and social-networking platforms and Twitter and YouTube and Wikipedia for film and photography, and the nearly century-old essay becomes a relevant, piercing alarm. Just as the mass dissemination of works of art in the form of film and photography produced what Benjamin believed was a less-authentic relationship to what actually, physically, exists, so does a virtual friendship machine like Facebook create a distanced form of "love" and "friendship" different than that which we previously enjoyed with what Gould calls "our meat acquaintances." Indeed, as Gould points out, the digital facsimiles of basic human activities ("chatting," "befriending," even "poking") oftentimes seem poised to outmode the actual physical acts on which they were originally modeled! Now tell me, what's there to <3 about that? We daresay Benjamin would agree. Until very recently, numberless hutong ran around the Forbidden City like the ramshackle castle town huddled against the surreal, claustrophobic Gormenghast. Indeed, one of Geremie Barmé’s many services is to show how Beijing served as inspiration for Mervyn Peake, who was born in China. “The Forbidden City” is the latest in an excellent series from Harvard University Press and Profile Books. A compact volume, it is an ideal and elegant history, good for keeping in the hand while visiting the vast extraordinary complex, which has at least been preserved. Mr Barmé, a noted Australian scholar of modern China, is as good at describing the Communists’ imperially-derived impulses as he is at banishments from the medieval court. ||| Learn more about The Forbidden City and the Wonders of the World series. Uncertainty and transience is part of [Hong Kong's] character and in City Between Worlds Leo Ou-fan Lee uses a variety of techniques—travelogue, revisionist history, cultural deconstruction, and personal essay – to pin down what he calls this “confusion and contradiction” while uncovering the deep communal roots that often go unnoticed by outside commentators. 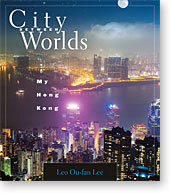 The very writing of this book is another way Lee gives voice and creation to “his” Hong Kong. City Between Worlds balances probing intellectual analysis, fierce criticism, and gentle warmth, all imbued with the frustrated love any city dweller will immediately recognize as the elusive grasp to define where one lives. We couldn't have said it better ourselves. As an added bonus, don't miss Leo speaking about his book at the Harvard Coop this coming Monday (June 23) at 7pm. The Coop is located in the heart of Harvard Square--it's pretty hard to miss. Hope to see you there. In today's politics, we hear a lot of talk about "toughness," which appears to mean the ability to stand at a podium to deliver pre-written bluster to a hand-picked audience. In 1920, Socialist candidate for President Eugene V. Debs didn't have that option, since at the time he was imprisoned in an Atlanta penitentiary for criticizing America's role in the First World War and the government's war on dissent that accompanied it. 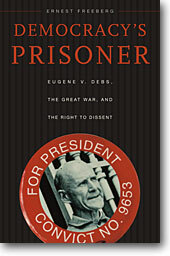 Debs' campaign to go "from the jailhouse to the White House" garnered over a million votes from Americans fed up with the government's suppression of free speech. Many of these Americans, among whom numbered scores of prominent intellectuals, didn't necessarily agree with Debs' socialist views, but nonetheless were shocked that the government would so cavalierly imprison someone for simply speaking his mind. Out of the campaign to free Debs was born a movement that would eventually give rise to the American Civil Liberties Union, changing forever the way Americans view dissent during wartime. If history is what the present wants to know about the past, "Democracy's Prisoner" is teeming with lessons. But above all, it's the story of one extraordinary man's showdown with the establishment -- and how that confrontation turned into a complex political struggle whose outcome was up for grabs. Carefully researched and expertly told, Debs' story also brings a fascinating era into sharp, vivid focus. || Read an excerpt from Democracy's Prisoner: Eugene V. Debs, the Great War, and the Right to Dissent, out now from HUP.